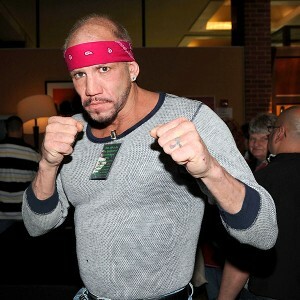 Former WBO heavyweight champion Tommy Morrison died in an Omaha, Neb., hospital late Sunday night. He was 44. Morrison's longtime promoter, Tony Holden, said Morrison died at 11:50 p.m. with his wife, Trisha, beside him. Morrison tested positive for HIV in 1996 before a fight with Arthur Weathers, effectively ending his boxing career. In the years that followed, he denied having HIV and also challenged the existence of the virus. Trisha Morrison, who married Morrison in 2011, picked up that fight, and in a recent interview with ESPN.com insisted that Morrison had Guillain-Barre Syndrome, not HIV. Bobby Bank/Getty ImagesTommy Morrison in April 2011 at an event in Parsippany, N.J.
Holden declined to comment Monday on the cause of Morrison's death. "I don't know what the official cause of death at the hospital will be," he said. "You prepare for things like this, and still you feel like you got hit by a truck when you hear the news." In 1993, Morrison beat George Foreman to win the World Boxing Organization heavyweight title. He lost to Lennox Lewis in 1995. He also gained fame for his role in the 1990 movie "Rocky V," where he portrayed "Tommy Gunn," a rookie boxer who is trained by Rocky Balboa, portrayed by star Sylvester Stallone. Morrison, as Gunn, goes on to win the heavyweight title in the movie and then later fights and loses to his mentor. I guess he heard the bell. Rest in peace, bi-curious boxer dude. Wow, he was young. His Sammy Davis Jr impression was pretty spot on. No one gets out of AIDS alive. Not if you believe Tommy Morrison. Indeed. Magic has the money.